“The Professional” A 10” [25cm] diameter model trimmer powered by a full 1/3 HP ball bearing, capacitor start motor. 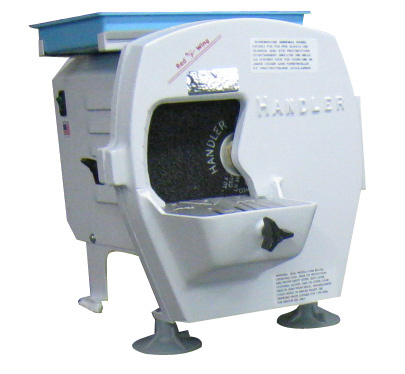 Features include a swing open front housing for ease of cleaning and wheel changing, internal gutter and “splines” to facilitate water runoff, full wheel radius water spray for efficient wheel cleaning, drain trough which completely surrounds the model tray to prevent water leakage, large 1” [2.5cm] diameter water exhaust, motor cover with removable top plastic utility tray. Unit shipped complete, ready to use with minor set-up. Finished with a durable, baked coating.